An interesting article was published on the Welsh language version of the BBC news site. It doesn't appear to have found it's way onto the English language version which means it has effectively been buried. Thanks to google those who aren't Wesh speakers can have a fairly good translation of the page here. I have archived both pages just incase it should suddenly vanish. 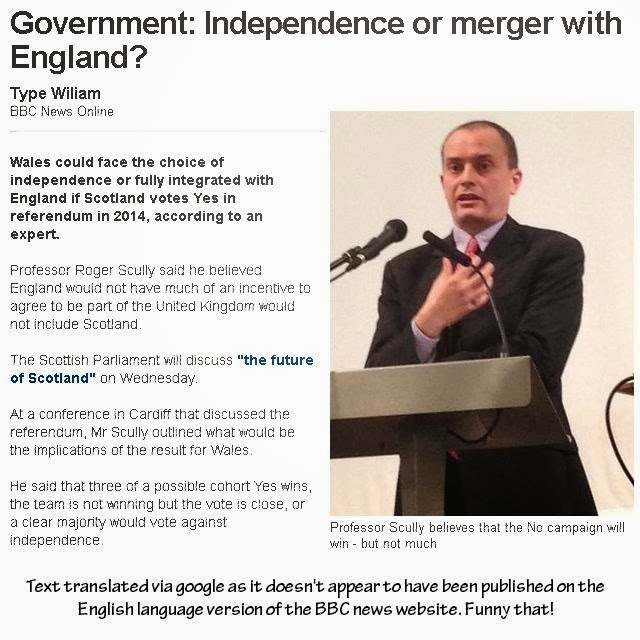 The story revolves around an opinion given by Cardiff University's Proffessor Richard Scully who believes that if Scotland votes for independence then England would seek to cast the rest of us off. 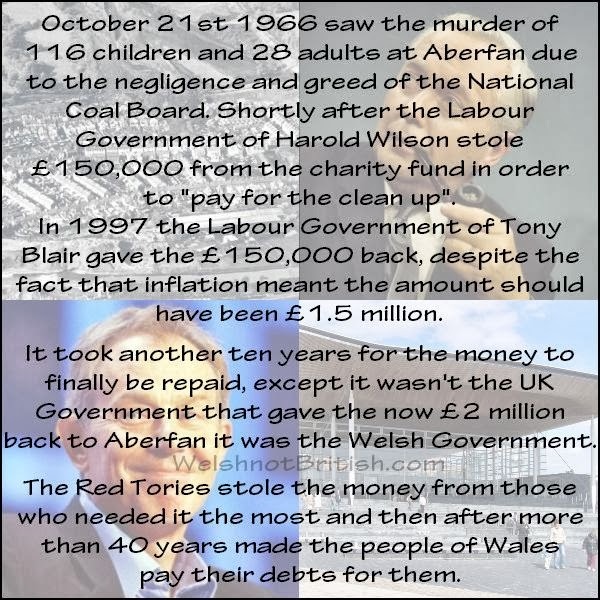 Shortly after October 21st, 1966 when the 116 children and 28 adults of Aberfan were murdered by the negligence of the National Coal Board, the Labour Government of Harold Wilson decided that they would take £150,000 from the memorial fund in order to pay for the clean up. I'd never heard of the Trussel Trust until today. I'd heard of foodbanks but not the people who appear to be behind the organising of a lot of them. So off I clicked to their website, where I read the following blurb. 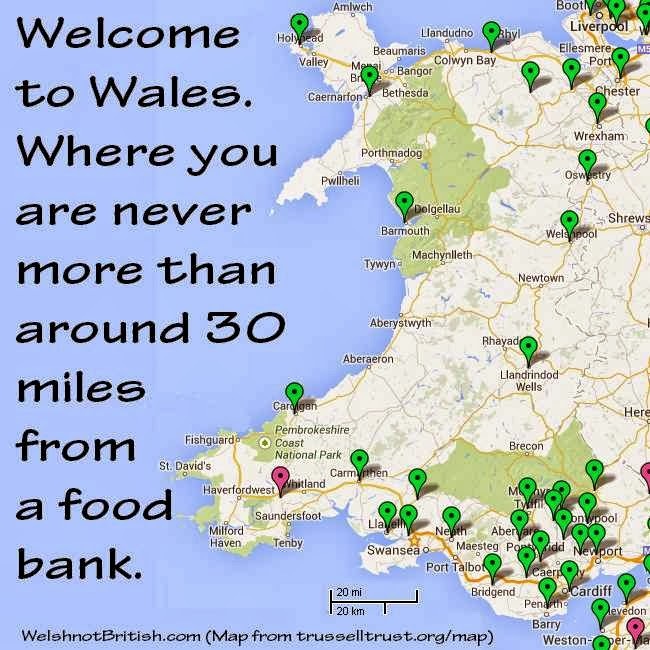 "The Trussell Trust works to empower local communities to combat poverty and exclusion in the UK and Bulgaria. We work with the people that society forgets, providing practical help through sustainable projects and enabling each person to realise that they are valued. Our vision is to build communities where people of all backgrounds are included and have the opportunity to live in dignity with hope for the future." It continues with references to religion but the cool feature of their website is the map. Maps like these are now incredibly simple to set up. You just create a google my map and then add place marks. You can add text and links to the map and embed them in web pages. They are simple but very effective. October 14th 2013 marks the 100th anniversary of the Senghenydd colliery disaster in which 439 men and boys died. The disaster came just 12 years after a similar explosion killed 81 of the 82 workers. The greed of the owners resulted in the second disaster. 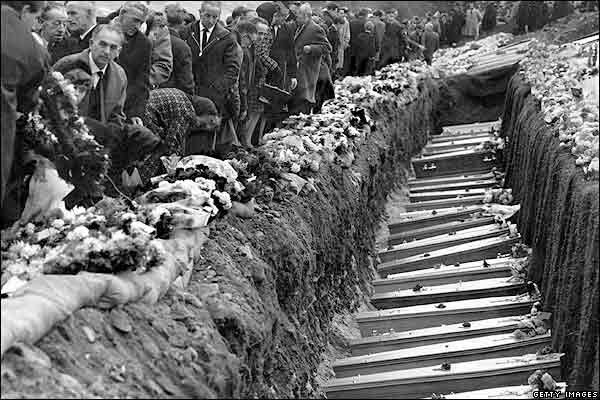 In a week it will also be the anniversary of Aberfan, when the negligence of the coal board saw 116 children and 28 adults murdered by an avalanche of wet slag. I use the term murdered for that is what the parents at the inquest shouted. 116 children and 28 adults 'buried alive by the national coal board'. 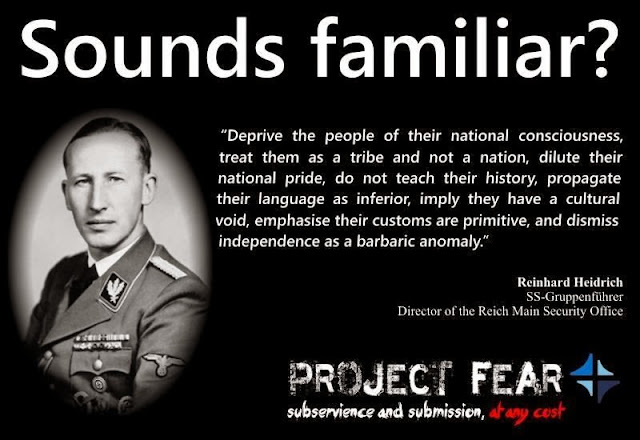 I noticed a quote started doing the rounds, it was attributed to a Nazi who was referring to the Germanisation of Czechoslovakia. But to read it it could have been about the Anglicisation of Wales, Scotland, Ireland and just about any country the English colonised. We often use racial stereotypes, usually in jest but often in more darker ways. Us taff have a fondness for sheep, the Italians are lazy, the Yanks are fat, the Scots are drunks, the Irish are all thieves, the French are cheese eating surrender monkeys and the Germans are notoriously efficient. To many, the Nazis were just a more efficient version of the British. Whilst the British took centuries to take over the world the Nazis wanted in done in decades. From the Berwick and Wales act, to the Welsh not and the blue books, right through to the modern day media that is both London owned and London based. This might as well be the speech from one of the unionist politicians that keeps telling us how small, poor and stupid we are. How we're better off being controlled by foreigners because we couldn't possibly run our own affairs. Did Reinhard actually say these things? That's debatable, when googling the quote I came across an interesting article referring to the brushing aside of Celtic history here which also has the quote above and via the magic of google books I found The Killing Of Reinhard Heydrich: The SS "Butcher Of Prague" written by Glasgow born professor of history Callum McDonald. You can search for key words within the book itself and it will present you a selection of search results, when you click on the result it will take you to that page. Some of the keywords I searched for are below. Dismiss independence as a barbaric anomaly. Whether he said the quote is almost academic at this point, perhaps the 'quote' in the graphic was pieced together by things he actually did as opposed to things he actually said. 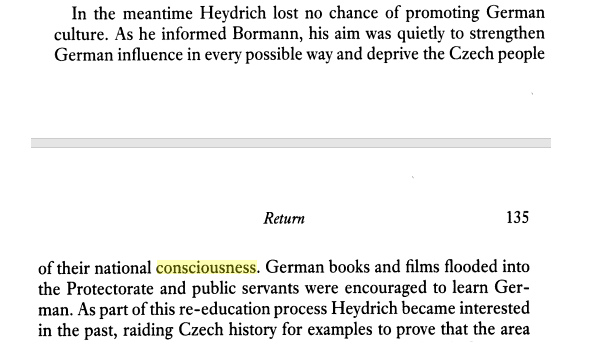 Everything in the quote happened in Czechoslovakia just as it has happened in Wales, Scotland, Ireland and every single colony invaded and controlled by the English Empire. In fact the word happened isn't quite right as that implies it isn't still happening. It is still happening and it will continue to happen until we free ourselves. It appears that Wales has lost another band. 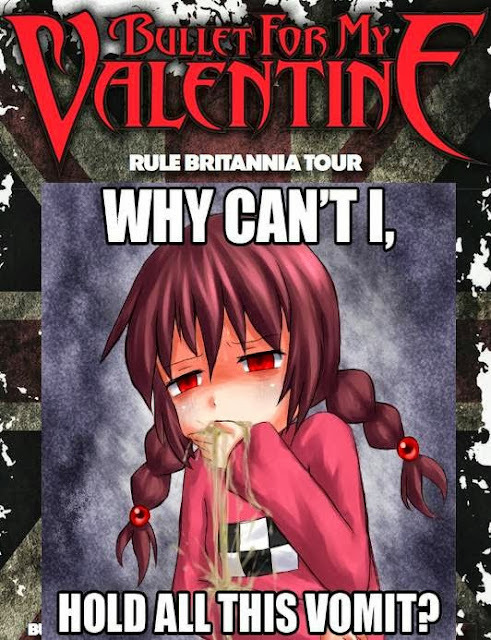 Despite the uniform rejection of Britishness by the three nations on this island, Welsh metal band Bullet For My Valentine are gearing up for their "rule Brittania" tour. 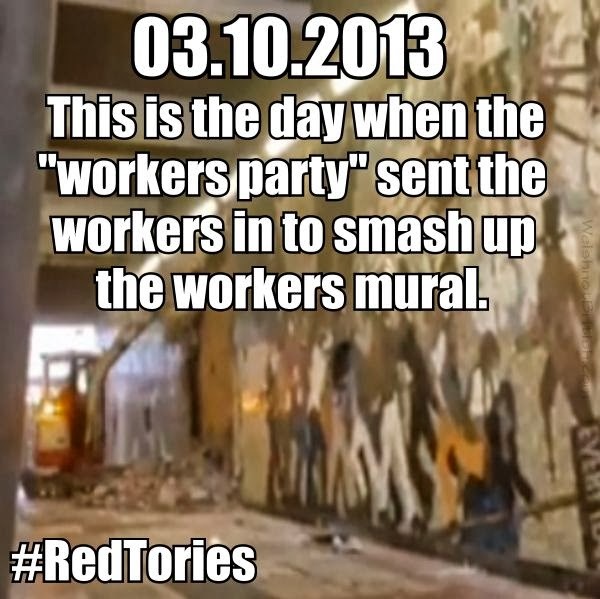 On the afternoon of October 3rd 2013 the Labour run council instigated a sneak attack on the mural celebrating the 1839 Newport Rising. Despite efforts from local campaigners their protests were ignored by the Labour run council. They were ignored by Labour's Culture Minister, they were ignored by Labour's Newport MP Paul Flynn and they were ignored by Cadw. For those not aware Cadw is the Welsh word for keep or protect. And yet the Chartist mural was not kept or protected from the Labour cabal that sought to destroy it in order to build a shopping centre.